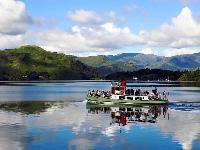 A fleet of steamers and launches sail daily throughout the year between Ambleside, Bowness and Lakeside with main season connections for the Lakeside and Haverthwaite Steam Railway, Fell Foot Country Park, Brockhole (National Park Visitor Centre) and the Lakes Aquarium. Public sailings, charters, rowing and self drive motor boat hire. Why not make the most of the light nights with Windermere Lake Cruises and come on one of our special cruises with a group of friends and party the night away! It's that time of year again when we are all looking forward to longer daylight hours and balmy summer nights. This year we are running Buffet cruises on board one of our steamers every Saturday in June and Saturdays and Wednesdays in July and August, departing from Bowness at 7pm for a two and a half hour cruise with live music and sumptious buffet. Discount for groups and families.